The Campbell Prediction System (CPS) is used to predict potential fire behavior of a wildland fire. CPS is used to adjust tactics and strategies to ensure the safety of firefighters and the effective use of resources. As a learning aid, this application lets you interactively adjust a fire's environment and conditions so that you can see how these affect the fire's behavior. 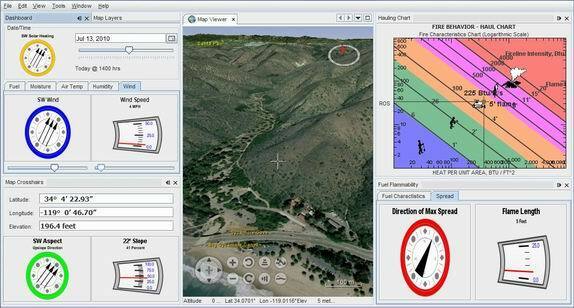 CPS is a NetBeans 6.9.1 platform application with a 3D terrain viewer using the NASA WorldWind Java SDK and JOGL. Figure 1. Example of main screen. [CPS-46] - Map viewer controls disappear after changing screen layout. Unable to restore them. [CPS-35] - Create "Tip of the Day" to be shown at startup.